John Smith started the day early having set his alarm clock (MADE IN JAPAN) for 6 a.m. While his coffeepot (MADE IN CHINA) was perking, he shaved with his electric razor (MADE IN HONG KONG). After setting his watch (MADE IN TAIWAN) to the radio (MADE IN INDIA) he got in his car (MADE IN GERMANY) filled it with GAS (from Saudi Arabia) and continued his search for a good paying AMERICAN JOB. At the end of yet another discouraging and fruitless day checking his Computer (made in MALAYSIA), John decided to relax for a while. He put on his sandals (MADE IN BRAZIL), poured himself a glass of wine (MADE IN FRANCE) and turned on his TV (MADE IN INDONESIA), and then wondered why he can’t find a good paying job in AMERICA. A Boeing 757 and a fleet of armored cars for Michelle’s sightseeing tour! Motorcycle outriders, armoured Chevrolets and bullet-headed men in raincoats criss-crossed London yesterday as Michelle Obama and her daughters spent a second day on an unofficial visit to the capital. 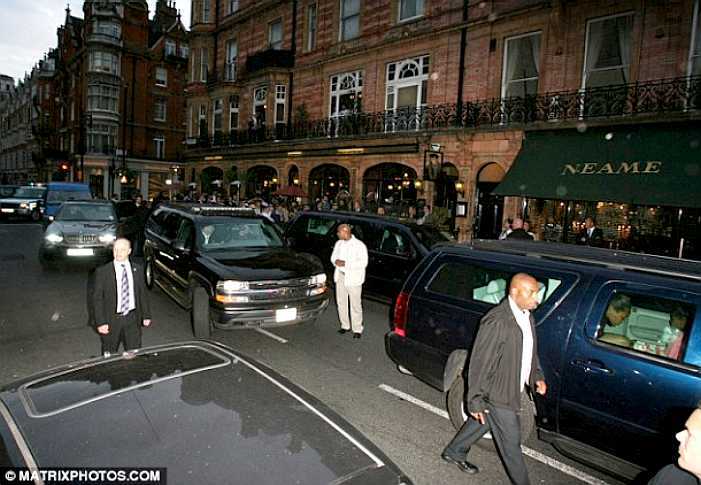 Michelle’s motorcade shut down the London street above as the First Lady of the World and her children go for Fish and Chips at a pub in Mayfair . The entourage inside the restaurant was 15 people while dozens more wait outside. Include the dozens of Air Force personnel to fly and service the plane, embassy personnel and other staff and we are talking about a serious expenditure of taxpayer dollars. Meanwhile, millions of Americans have lost their jobs and won’t be able to take their family on a summer holiday. Despite their circumstances they’ll still be expected to fork over the tax dollars to pay for Michelle’s trip!